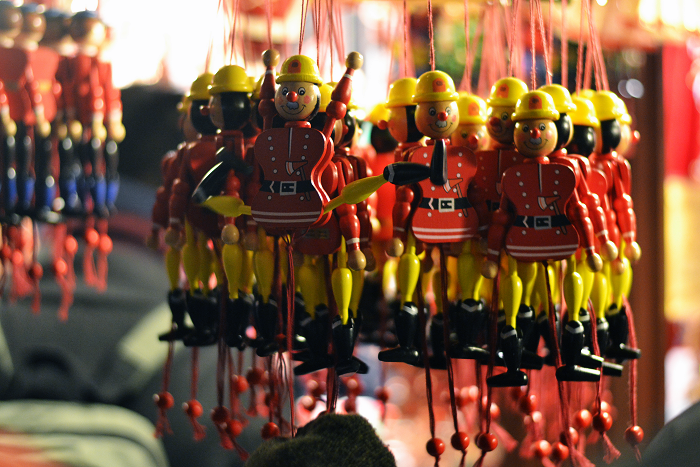 While S's brother was visiting us in Chicago, we went to an annual event - the outdoor German Christmas market downtown. 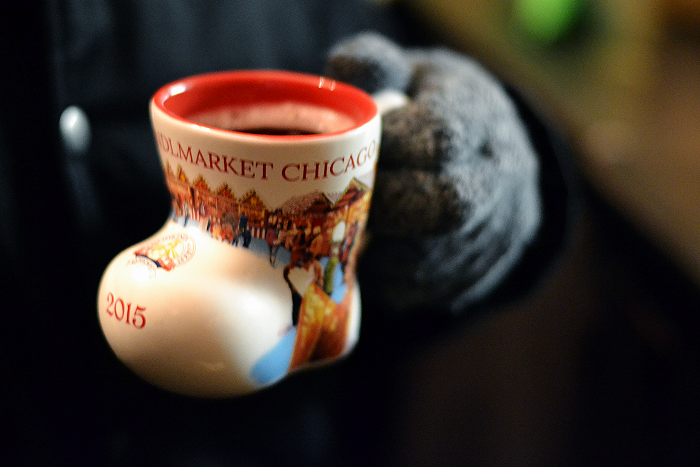 I was told by my new French friend that the Chicago Christmas Tree used to be inside of this Christkindlmarket. But this year was the first that they decided to put it in Millenium Park (where the bean is!). I must say, I like it's new home. 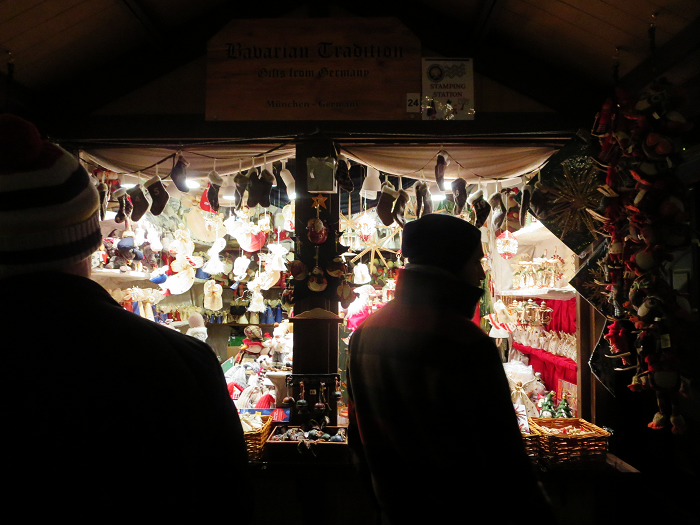 We visited the Christkindlmarket on one of it's busiest weekends (after Thanksgiving). 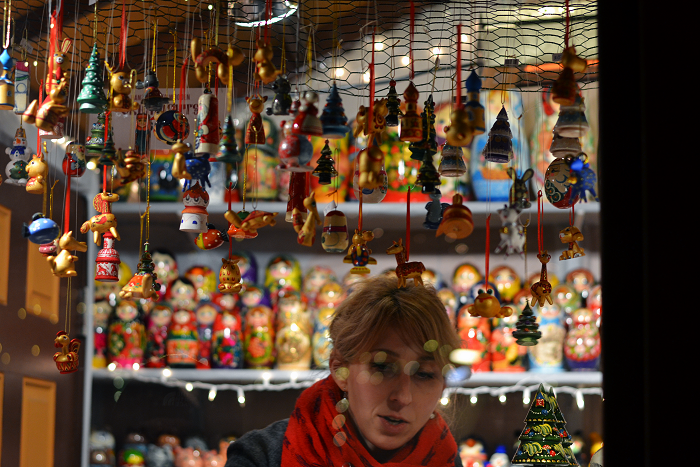 While the market was crowded, the tree a few blocks away had its own crowd! I couldn't imagine the crowds trying to protect their newly purchased ornaments, keep their mulled wine from sloshing, while also battling the crowds of those there only to see the tree. 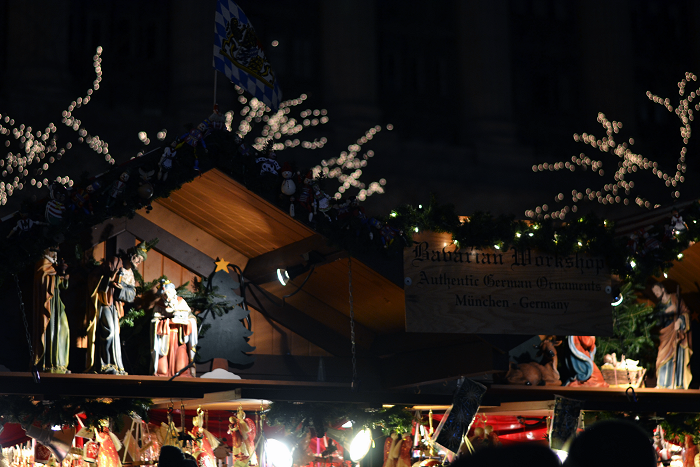 There were stalls that sold handmade ornaments, some food vendors, and of course, a tent that poured hot mulled wine into a little boot souvenir. 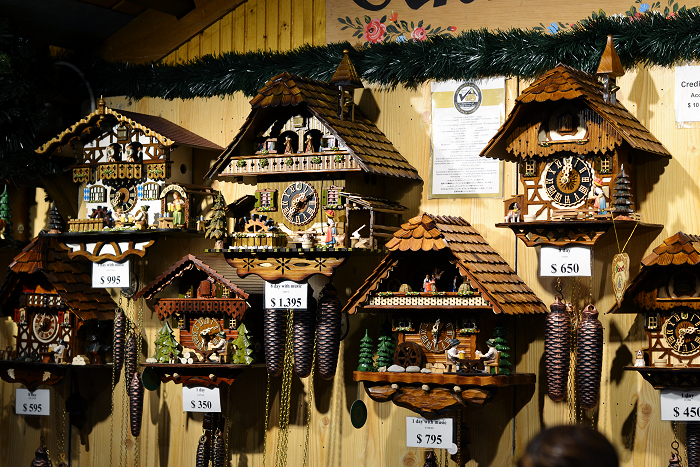 There was one vendor that sold ornate cuckoo clocks (S loves cuckoo clocks) as well as little wooden men, some with a tiny little pipe. So cute! 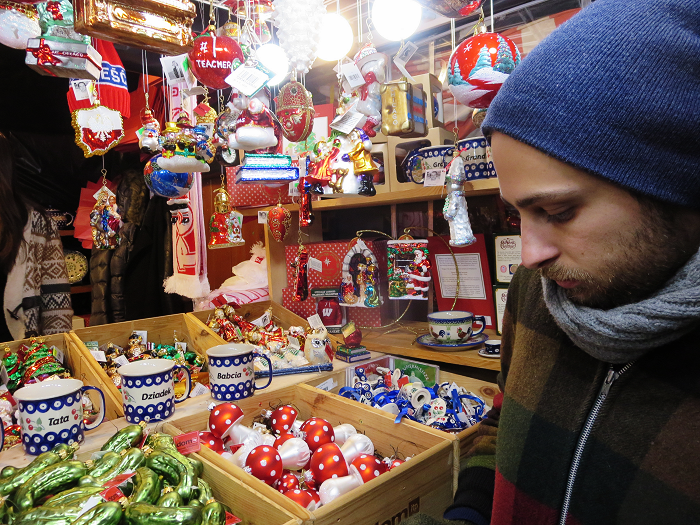 We almost bought a pickle ornament - which is a German tradition! My mom already gave me a pickle ornament a few years ago (my grandfather is German) so we opted for a pictaresque mushroom instead. There were mushrooms with a little moss and dirt at the bottom of them - but for $30 a piece... I just might have to make one myself instead. I'm finding it hard this year to be in the Christmas spirit. We have been working late or have had social arrangements a lot lately. At the office, I don't always listen to music, so I haven't even heard my usual dose of holiday music. Old favorites like Frank Sinatra's Christmas songs, She & Him's Christmas albums, and Sufjan Steven's Christmas albums normally do the trick. This time of year, I'm normally knitting to keep my hands warm, but northern heating systems are work-horses, so we keep toasty inside. The nights feel long because the sun goes down early during these winter months. I like to think that it's Chicago's way of showing off the holiday lights around the neighborhood. Coming home to the neighbor's fences draped in twinkling lights, green garlands, and red bows is just as warming as coming home to the crunchy fall leaves on the ground, like in fall. 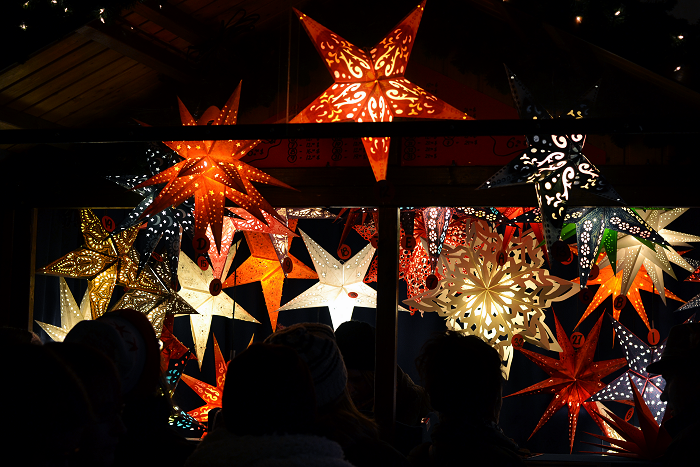 Even though the trees are bare, looking stark naked, the city is still beautiful with giant snowflake decorations on the street lamps and shop windows filled with shiny and suspended ornaments. There are only a two more weeks until Christmas, and I'm determined to feel the holiday spirit.